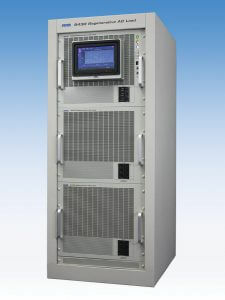 NH Research, Inc. (NHR) continues its technology leadership in test and measurement by introducing the 9430 4-Quadrant Regenerative AC Load with HiVARTM Technology. The load is compact, modular and field expandable which is ideal for bench-level use or designing into automated test equipment (ATE) systems. An advanced built-in measurement system further simplifies loading by providing the essential functions of a digital multi-meter, current transducer, power analyzer, and oscilloscope. This combination of HiVAR technology, expandable power and built-in measurements make the 9430 an ideal AC load, providing the power and measurement needed for general laboratory use. HiVAR technology extends the usable true power (kW) and eliminates the VA de-rating penalty when loading with high reactive power levels. It accomplishes this by providing continuous operation up to the maximum voltage, current and true power (kW). Systems with HiVAR break the VA-only rating tradition in two ways: First, the load is able to transition between high-voltage and high-current regions along the true power curve without requiring either a range change or requiring the output to be switched off to change ranges. Second and often overlooked, reactive power (VARS) increases the apparent power (VA) but not the true power (kW) required in testing. The 9430 is able to maintain full current and full voltage up to full true power rating providing this additional reactive power (VARS) without reducing the true power (kW) capability of the load. The advanced built-in measurement system is based on a 125kSample/sec digitizer, which is able to take advantage of separate voltage and current ranges, further improving measurement accuracy. These range selections are independent allowing any combination of high & low ranges to be selected for voltage and current, occur seamlessly and do not require the output to be turned off. With NHRs new 9430 AC Load, It has never been easier to simulate true displacement-current shifted current draws, programmable and slewable power factors, harmonics and distorted loading, and programmable loading transients.